Beta Alanine is a non-essential amino acid typically found in meat, fish and poultry. Your body primarily uses beta-alanine to form a compound molecule called carnosine, which is stored in your muscles and brain. It does this by combining beta-alanine with an essential amino acid, L-histidine. Where carnosine is of interest to athletes is because it helps buffer the acidity produced by hydrogen ion accumulation when we exercise. When a muscle contracts repeatedly, it becomes more and more acidic and causes our muscles to feel a burning sensation. This is one of the ways muscles become fatigued. Higher carnosine levels in the body therefore result in an increased ability to buffer these hydrogen ions and reduce the burning sensation. Carnosine counteracts this by reducing muscle acidity, thereby increasing the amount of work the muscles can do before they become fatigued. Beta Alanine is the limiting enzyme in the synthesis of carnosine. In other words, the amount of carnosine your body produces is directly dependent on the amount of beta-alanine available. Without sufficient beta-alanine, carnosine synthesis is limited. Similarly, beta-alanine supplementation has been shown to delay the onset of neuromuscular fatigue. Although beta-alanine does not improve maximal strength or VO2max, some aspects of endurance performance, such as anaerobic threshold and time to exhaustion, can be enhanced, making it beneficial to both endurance and strength athletes. Beta Alanine has been shown to be particularly effective in improving performances in the 0-6 minute range so relatively high intensities. By improving the time taken to reach fatigue athletes can perform at higher levels in short sprints, climbs or jumps in intensity. In training you will likely be encountering these intensities frequently during intervals and anaerobic training. When we’re looking at exactly how much Beta Alanine supplementation increases performance by the answer generally falls in the 1-2.5% range. The chart below neatly shows the sprint performance improvements from a number of studies, as you can see the shorter the interval the greater the improvement. As you can see as an individual ingredient Beta Alanine isn’t going to make you superman over night but small improvements when combined with other ingredients such as those included in Racestak can have a larger combined effect and over time in combination with high intensity training sessions offer a greater improvement in performance. A clinically effective dosage of a supplement is one that has been observed to work in the context of scientific studies. Studies investigating effective dosages have observed that dosages of 4.8 grams are more effective than 2 grams when delivered on one off or infrequent basis but there isn’t too much of a difference when the supplement is taken every day. In order to avoid the common side effects of paraesthesia you may choose to break your dose of Beta Alanine into multiple dosages of 0.8 grams or less. However if you find taking multiple dosages throughout the day awkward you can consume Beta Alanine in a single serving. Paresthesia is a harmless side effect that affects some people after consuming a large dosage of Beta Alanine. This tingling or pins and needles sensation is harmless and greatly varies from person to person but typically lasts for around an hour to 90 minutes. After a few weeks of consuming Beta Alanine the sensation tends to subside in most people. Beta Alanine benefits from a loading phase greater than 3 weeks in length which allows for a faster accumulation of carnosine in the muscles. In this way, a higher dosage allows you to realise the benefits faster and allows for missed days here and there. 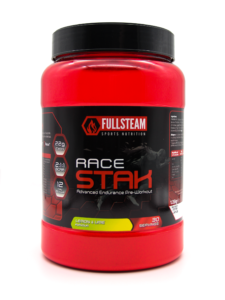 RACESTAK contains 4.5g of Beta Alanine to achieve an effective dosage when used in conjunction with a typical training programme. Currently, there is no safety data on the long-term use of beta-alanine (i.e., > 1 year). However, due to the non-essential nature of this constituent (i.e., beta-alanine is produced endogenously), the likelihood of safety concerns are low. (2) Eric T. Trexler†, Abbie E. Smith-Ryan, Jeffrey R. Stout, Jay R. Hoffman, Colin D. Wilborn, Craig Sale, Richard B. Kreider, Ralf Jäger, Conrad P. Earnest, Laurent Bannock, Bill Campbell, Douglas Kalman, Tim N. Ziegenfuss and Jose Antonio International society of sports nutrition position stand: Beta-Alanine, Journal of the International Society of Sports Nutrition 2015.